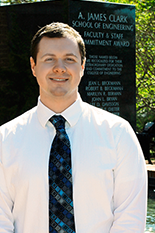 The American Institute of Aeronautics and Astronautics (AIAA) has awarded aerospace engineering graduate student Robert Fievisohn an AIAA Foundation Martin Summerfield Propellants and Combustion Graduate Award. This award is given in honor of Martin Summerfield [1916-1996], an American physicist and rocket scientist, to graduate students doing excellent research in the air and space sciences. Fievisohn is currently working on his Ph.D. under advisor Associate Professor Kenneth Yu, conducting theoretical research into the fundamental physics that occur in Rotating Detonation Engines (RDEs). He received his B.S. from Clarkson University in 2008 and was then commissioned as a 2cd Lieutenant in the U.S. Air Force. Fievisohn went on to the Air Force Institute of Technology to complete his master's, and then worked at the Air Force Research Labs in the Aerospace Systems Directorate. In 2013, he separated from the Air Force as a Captain and came to the University of Maryland to pursue his Ph.D.
Official recognition of awardees will be made during the Awards Presentations Ceremony at the AIAA Propulsion/Energy Forum. In addition to the $1250 stipend, the AIAA Foundation presents recipients with a special recognition plaque in honor of the award.